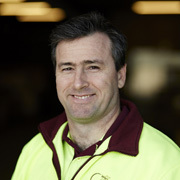 I spent 12 years on road as a courier before moving into the office as a customer service team member and allocator for Fuji and Bunnings drivers. I also gained a lot of home delivery experience supporting the IKEA dedicated fleet for two years as an allocator and service manager. Seeing people grow and take the opportunities that working with ANC presents, be they drivers, staff or clients. Ride my bike, listen to my music, watch my footy, practice my poker face with mates, spend time with my family and keep my wife happy! In my role, it’s about developing and maintaining a high level of professionalism amongst our fleet and support staff. That’s going to help them perform at their best, individually and as one team, working towards the same goal. And that’s what creates those extraordinary service experiences for customers.